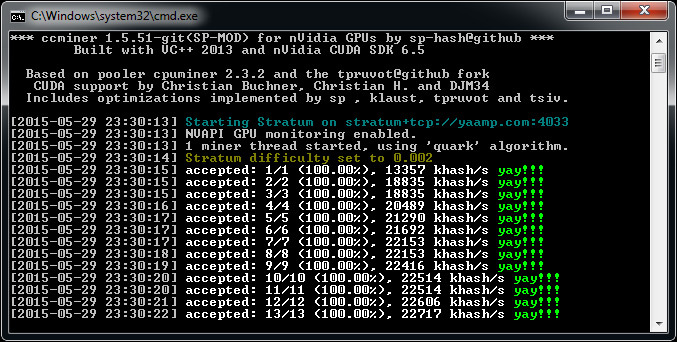 Time for a new quick update in the form of a Windows binary compiled from the latest Git source code of ccMiner 1.5.52-git SP-MOD fork of the Nvidia GPU miner optimized for the latest Maxwell-based video cards by SP (source). 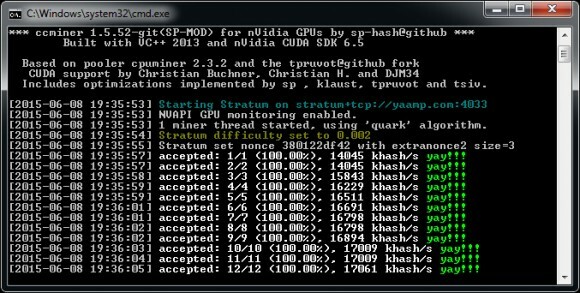 This version includes some performance improvements in some of the supported algorithms such as Lyra2RE for GTX 970 and more Quark optimizations for improved hashrate, so as usual you might want to update for the best performance. As it seems that at the moment Lyra2RE and Quark are the most profitable algorithms to mine with GPU. The SP-MOD fork of ccMiner is designed for Nvidia Maxwell GPUs such as the already available GTX 750, 750 Ti as well as the newer GTX 960, GTX 970 and GTX 980. The Windows binary release we have made available here is compiled with support for Compute 5.0 and Compute 5.2 GPUs or with other words only for Maxwell-based cards with CUDA 6.5 and VS2013. 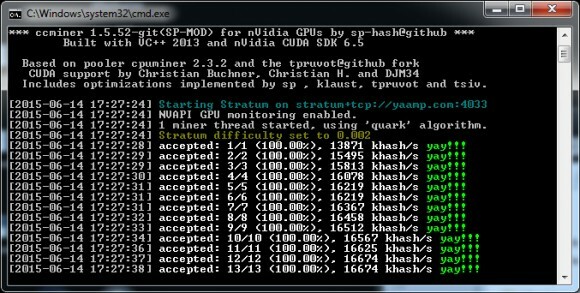 Here comes a new update in the form of a Windows binary compiled from the latest Git source code of ccMiner 1.5.52-git SP-MOD fork of the Nvidia GPU miner optimized for the latest Maxwell-based video cards by SP (source). This version includes some fixes and minor performance improvements in some of the supported algorithms, so as usual you might want to update for the best performance. The SP-MOD fork of ccMiner is designed for Nvidia Maxwell GPUs such as the already available GTX 750, 750 Ti as well as the newer GTX 960, GTX 970 and GTX 980. The Windows binary release we have made available here is compiled with support for Compute 5.0 and Compute 5.2 GPUs or with other words only for Maxwell-based cards with CUDA 6.5 and VS2013. New update in the form of a Windows binary compiled from the latest source code of ccMiner 1.5.51-git SP-MOD fork of the Nvidia GPU miner optimized for the latest Maxwell-based video cards by SP (source). 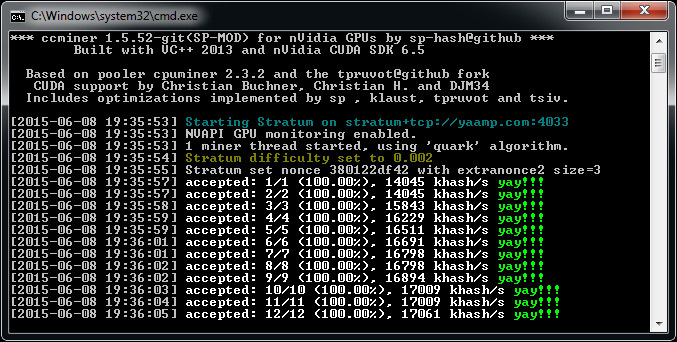 This version includes numerous fixes and some performance improvements in Groestl and Quark as well as faster AES. The SP-MOD fork of ccMiner is designed for Nvidia Maxwell GPUs such as the already available GTX 750, 750 Ti as well as the newer GTX 960, GTX 970 and GTX 980. The Windows binary release we have made available here is compiled with support for Compute 5.0 and Compute 5.2 GPUs or with other words only for Maxwell-based cards with CUDA 6.5 and VS2013.